I would like to start making my Halloween costume soon. It's going to be sort of complicated (at least the head-piece) and I tend to procrastinate. 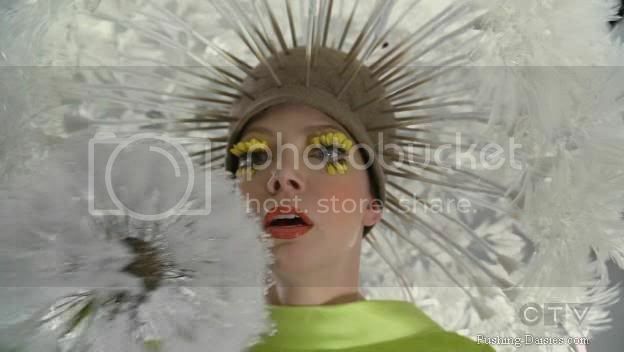 This year I really want to go as one of the show room models in the "Pushing Daisies" episode "Dummy". I saw the girls and instantly fell in love with their costumes. The models are dressed up as dandelions and have a green shift dress on and go-go boots. The best part though is the head-piece they wear. The dress part is easy and I can find the shoes around Halloween or at a vintage store. 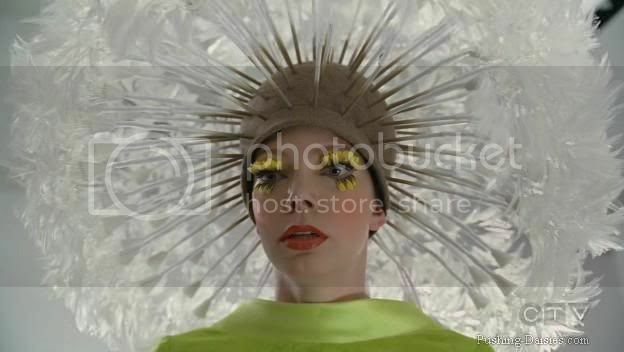 The problem is I'm not exactly sure how to start making the dandelion head piece. It looks like it could be a hat with the added spores but I'm not sure. And I'd prefer the long seed parts to be shorter. I just need an idea of what to use to make those parts. And a suggestion for a hat pattern would be wonderful too because I've tried doing hats without a pattern and it was a mess. Any help would be immensely appreciated because right now I feel very lost as where to even start. First off I think its an awesome idea for a costume. Could you use fake white daises for the spore tops? I think that would be cool if you could figure it out. I also think you are right on with the hat base. Good luck. Make sure to post pictures! good luck and I CANNOT WAIT to see what you do! The spores look like those feathers you get in the floral department that are on long stems. that hat looks like one of those flapper hats i think they are called a cloche i think it also looks like it is made out of felt or something like felt. Here is a pattern for a crocheted one. I would start out with one of those highlighting caps you use when your highlighting your own hair. It's like a shower cap with tiny holes in it and you can get one at Sally Beauty Supply. Then I would maybe get a bunch of long stemmed flowers or feathers and thread them each through a clear plastic straw or even a small cocktail straw (smaller and sturdier). Poke the pointy end of the feather through the cap and bend it into a loop with a needlenose wire cutter and bend the loop flush to the cap. Secure the straw with a bit of hot glue. Then I would wear another cap/shower cap underneath so the little wires don't get stuck in your hair. That's just what came to my mind. Good luck with your costume! You could use some craft wire and make a T shape and poke it through the hat. if you wanted to wire to be green or brown you could wrap the wire in floral tape. That would also give you a way to attach the feathers to the tips. I was thinking for the fluffy bits at the top, how about a feather boa? or do you really want it all individual? from looking at the pic & what other people have suggested, the best i have come up with so far is it looks like a fitted felt cloche hat. the stems are made of small wooden dowels with either small white feathers or rolled shredded cellophane or something like that, fluffed out on the end & taped wrapping them to the dowel. then painted brown on one end to match the hat fading into white the rest of the way. to make them stand up i like the idea of the feather picks but that seems pricey given the number you would need. you could get a couple of packs of small dowels or chopsticks for a few dollars i think. i like the idea of the highlight cap someone posted, but using dowels, i could make little holes in the cloche where i wanted the dowels to come out & poke them through, glue small flat disks to the inside end of each one, then glue those to the cap. if you tied the hat behind your head you could hide it under the cap. i think with the snug fit of the cap against the head, the disks will push the stems out, & the cloche will help to hold them up, hiding everything underneath. you would need a really strong glue that would hold up to how hot it's likely to get under your hat - E6000 or the like? then glue down the feathers/whatever around the end & wrap tape over them, & then paint them. well, the dowels should be made & painted before putting the hat together so i'm out of order hear but i'm sure you get that. oh, i do also like the idea of using wire instead of the dowels & wrapping the wire in tape all the way down. though i think the pic looks like dowels or maybe paper tubes? maybe you could stay up all night eating pixie sticks & then recycling those tubes for the hat as you go? pixie sticks = crafting fuel or drinking straws over the wire. you can get a pack of 100 or so for a $1 usually. i hope this makes sense. i'm sure it's obvious i typed what i thought with little formatting involved. keeps the ideas fresh! it looks really awesome & i can't wait to see what you end up doing & how it turns out. I second the straw idea... I think even though small dowels are fairly light, 100 of them will get pretty heavy. I say find a pack of white drinking straws and spray paint the bottom to get that nice brown gradient. I think although it may be expensive, depending on what you can find, you're best bet is to purchase a felt cloche to use as the base. It may be in your best interests to reinforce it with millinery wire, at least around the base, and possibly put some kind of counterweighting in the front to keep it from slipping off your head. Good luck! That's an awesome episode, and a really cool hat, so I can't wait to see what you decide to do. This is an awesome idea; good luck pulling it off!